Perched above clear turquoise waters, these 9 Tahiti-style bungalows feature breathtaking ocean views and exclusive amenities. Swim right up to luxury with these unique suites perched at the edge of a lagoon pool. Inside, luxurious romance abounds with four poster mahogany king size beds and sumptuous marble bathrooms. Step onto your private patio and enjoy a romantic meal, a cool drink or a moment of quiet relaxation. 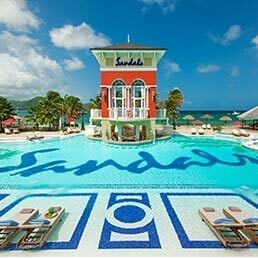 Set on a spectacular peninsula, Sandals Grande St. Lucian sits between the Caribbean Sea and Rodney Bay - Saint Lucia's most beautiful bay and home to the calmest waters on the island. At the tip of the peninsula is Fort Rodney, a bluff-top holdout during Britain's 150-year war with the French. Enjoy the views from every angle. 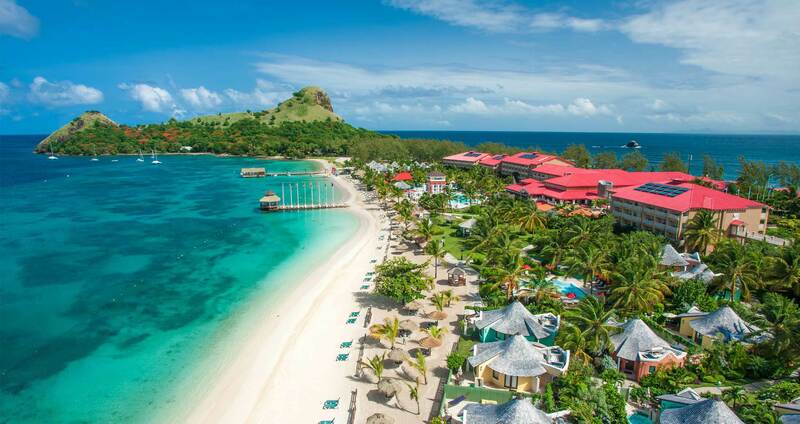 Set on a mile-long stretch of perfect, white-sand beach, Sandals Grande St. Lucian offers beachgoers magnificent views and the perfect place to relax. If you're looking for a little more activity, take to the water on a kayak, a paddleboard or a sailboat, or explore beneath the waves with some snorkeling right from the beach. At twelve world-class restaurants, a global team of master chefs caters to your endless culinary cravings. From the grilled island dishes of Gordon's on the Pier and the tasty British fare of Olde London Pub, to the heart-warming Italian cuisine of Toscanini's, passions of the palate are served to absolute perfection. 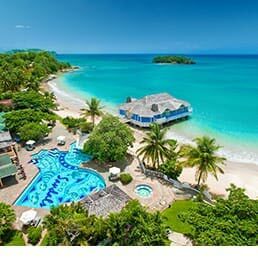 Guests staying at Sandals Regency La Toc can enjoy the 9-hole The Sandals Regency La Toc Golf Club on premises, or take a free transfer to the nearby 18-hole Sandals St. Lucia Golf & Country Club at Cap Estate. Both courses inspire performances at all levels, and complimentary green fees invite repeat plays at leisure. Five main pools dot this spectacular property, including the signature Sandals pool with the iconic Sunset Tower and swim-up bar, an intimate heart-shaped pool shaded by coconut palms, and a meandering lagoon pool that lets you swim up to your room's front patio. And for those who want to learn to dive, our scuba pool is where you'll begin. The tranquil Over-the-Water Serenity Wedding Chapel at Sandals' Grande St. Lucian is a first of its kind on any island in the Caribbean and offers spectacular panoramic views of Rodney Bay. The chapel's elegant sea–inspired décor includes a beautiful Riverstone alter, a glass aisle made up of three water–viewing floor panels, and an open–air design that invites in the natural surroundings. 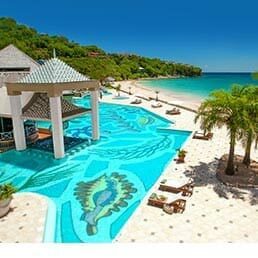 From Over-The-Water Bungalows to Beachfront Rondovals to Swim-up Suites, Sandals Grande St. Lucian features the most unique and luxurious rooms and suites with an air of romance. Embark on a culinary journey around the world, where sumptuous cuisine is the perfect prelude to romance. There are twelve scintillating gourmet restaurants to choose from, each waiting to delight and surprise you. It's a global culinary extravaganza - and you'll never even have to leave the resort to enjoy it all. The new Over-The-Water Bungalows at Sandals Grande St. Lucian deliver an immersive journey of the Caribbean's finest turquoise waters. 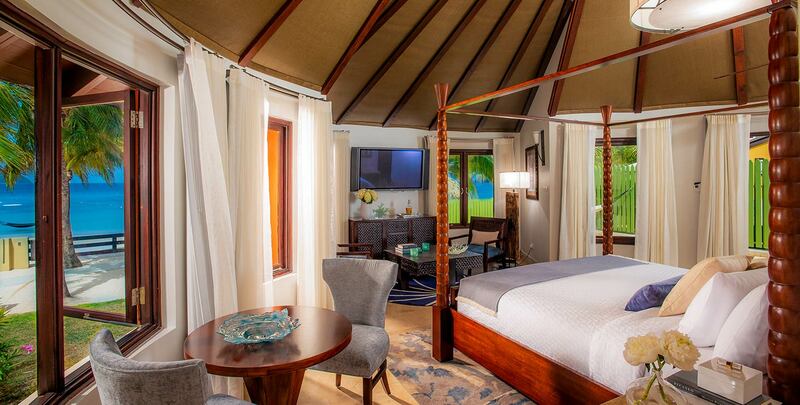 Featuring a Tranquility Soaking Tub™ for two, an over-the-water hammock, sun deck with swim-up platform, and "sea-through" glass floors, these innovative suites marry modern luxury with exotic palapa-style architecture.